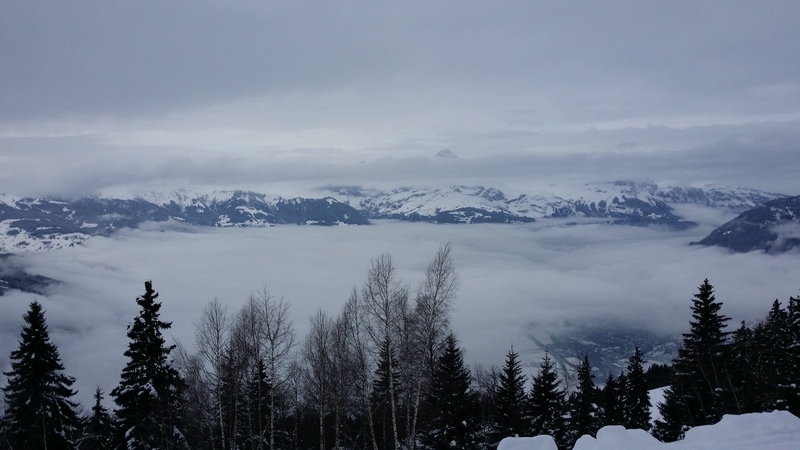 Skiing Inbetween the Cloud Layers! We finally got to get out on the slopes! It took some encouragement, as the cloud was low, and a heavy grey/white so we were expecting poor visibility. It had snowed so we decided that even if it was a bit of a white out the snow should be good, so headed out to Les Houches. As it turned out, even though it all looked a bit flat in places, the snow condition was the best we’d had all season, so it was really worth going out, and was so glad we did. I finally managed to find my ski feet again, after all the scrappy, scrapey stuff, earlier in the season and it turned out the best so far. It looked like we made the right choice as from Les Houches we could see that most if not all of the Chamonix slopes were covered in cloud, we somehow managed to find a clear level between the two layers. We enjoyed a good few hours skiing!